Heat a large pot over medium heat. Saute onions and carrots until just starting to carmelize, about 12 minutes. Add garlic, tomato, and paste. Cook for 5 minutes longer. Add the remaining ingredients and bring to a boil. Once you reach a boil, add the duck. Bring back to a boil, and then reduce to a simmer and cover. Cook until duck is tender, about 60 to 90 minutes. When duck is tender, remove and cool slightly. Then hand shred the meat. Strain the cooking liquid, and return to pot. Add shredded meat and return to a simmer. Season with salt and pepper, and simmer for 20 minutes. Place the potatoes in a pot and cover with water. Bring to a boil, and cook until tender, 30 to 40 minutes. Remove from the water and allow to cool slightly. Peel the potatoes, and then run them through a food mill or ricer to remove any lumps. Add clove, salt, and pepper. Beat the eggs together and add to the potatoes. Mix well. Add 3/4 of the four and mix well. If dough is sticky, add the rest of the flour. Potatoes vary my size and moisture content, so you may need a little more flour to make a dough that isn’t too sticky. When dough is no longer sticky, turn out to a well floured work surface and roll out until you have a 1 inch thick round stand. Cut this into 1 inch pieces. Run each piece down the tines of a fork to make grooves. Bring 2 quarts of salted water to a simmer. 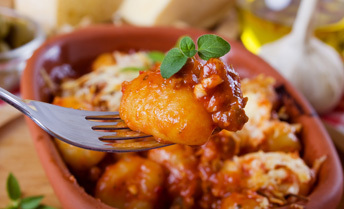 Add the gnocchi in small batches and simmer until they float. Cook for 1 minute longer. Remove and dry off. Just before serving, melt the butter in a sauté pan and cook the gnocchi until heated through and crispy, about 5 minutes.